Eyes: Aqua-blue Weight: 325 lbs. The infant Aquaman was abandoned on a mound of coral called Mercy Reef. Since he was blond, Atlantean superstition condemned the youth to die by setting him loose in the ocean. He survived and was raised by lighthouse keeper, Tom Curry, who taught him the ways of the surface world. Aquaman believes he is Arthur Curry, son of an Atlantean woman and a surface man. Aquaman played the role of world hero, sometimes with his young ally, AQUALAD. He was a founding member of the JUSTICE LEAGUE of AMERICA and was even the team's leader for awhile. He fought various villain, mostly of the sea-faring variety, including his brother, Orm, also known as the OCEAN MASTER. 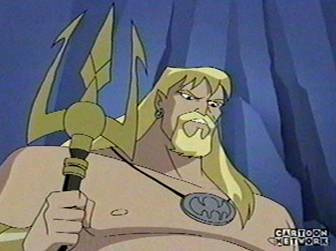 Aquaman became king of Poseidonis, one of the sunken cities of the continent of Atlantis. He ruled fairly, yet was more of a protector than a monarch. He was the first Atlantean to officially marry an outsider--MERA, a queen from a dimension of water, whom the Poseidonians made an honorary Atlantean, They had a son, Arthur, Jr., sometimes called "Aquababy." And then, Aquaman was alone--everything taken from him. His child was killed in a battle with one of his foes, BLACK MANTA Aquaman feels he's to blame for his son's death--that he was late in a time of true crisis. Although Aquaman thinks he never repaid BLACK MANTA for this murder, he is not a hero of vengeance, but of justice. He respects laws of every land--except in the ocean, where he himself is the law. | His son's death devastated Aquaman. He retreated by becoming a workaholic, unrelenting, afraid to stop for fear all the emotions would come crashing down upon him. Eventually, the death of her son drove MERA to the brink of insanity, and she returned to her own dimension. Aquaman abdicated his throne, as Poseidonis held many sad memories. He will always care for the city and its people, but feels he's a man without and real roots. Rather than deal with his emotions, Aquaman prefers to act on them--fast. Sometimes a little hotheaded, he hates to lose his temper. Anger is one of the few emotions he understands how to confront when it comes from others, but not from himself. introverted, he rarely shares his emotions, except with the fish, around whom he feels safe. No chance of failure. No chance of being abandoned again. Aquaman has set up an ideal of perfection for himself to live up to, because "perfect" is what people have always expected him to be. Perhaps he carries the responsibility of being a hero too heavily. he always wants to help others, often to the depravation of his own needs. Aquaman is of a conservative demeanor, and enjoyed being a husband and father, but doesn't know if he could ever build another family. He is loyal and just can't let go. A natural leader, Aquaman is a determined hero who sill always triumph over odds both without and within. He is sill finding new aspects of himself and endeavoring to truly understand his dual nature as man of the sea and land. Aquaman has the ability to directly communicate with most sea life. He is the only Atlantean possessing this trait. This telepathic power varies with the creature he is communicating with: for instance, a guppy will react as if it was given a command, but a dolphin may argue with him. He cannot make any creature do anything against its nature. Aquaman can receive thoughts within certain intelligence levels. Mostly he has the ability to sense primal emotions. Aquaman can swim underwater over 87 n/mph (nautical miles per hour) or approximately 100 mph, slightly less on top of the water. Because of his dense body structure, Aquaman can withstand great pressure and changes in temperature. On land, Aquaman is much stronger than average humans, but his strength diminishes the longer he stays out of water. Under average conditions, Aquaman is at peak strength for about an hour, after two hours he is very weak, and will drop into a coma and be near death at the end of three hours. He is able to survive longer in a tropical rain forest than in a desert. To replenish himself, Aquaman must "breathe" water. This means anything from a quick shower to a long swim.